Yes, apparently, it's been 'Rainbow Dash Day' (I learned of this, through EStories): www.equestriadaily.com/2016/02… So, I figured it'd be daft not to draw at-least something for everyone's favourite Pegasus. Of course, I've used a vector or two to help me out with this one (all rights belong to the respectful owners): Also as a means of speeding things up here. ^_^ Oh, and Tank's in the background a little as well! Because why not. So, it's not much, but it's the least I could do to show my support for Rainbow Dash. 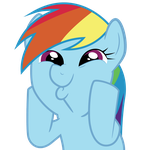 So February 1st is the official birthday for Rainbow Dash? Confirmed by Hasbro? Good, so I drew this in time, then. Oh, sorry! That sounded a bit different to me... Yeah, I suppose it is. Is Dash having a good day? Why wouldn't she? This is a day dedicated to her awesomeness. Hey, you think that Twilight should have her own day as well? They should all have their own day!